I would not normally post something like this on this blog, but it is somewhat possum-related and I think that people who care about wildlife should know about the sort of thing that goes on here in Queensland. Recently, on a nearby building site, a developer has cleared a group of gum trees - some about 100 years old - apparently [I have to use this word because of the legal situation] in violation of a court order. This event was featured (very briefly as part of another story) on the Channel 9 news. The photo below is of one of trees that was destroyed. 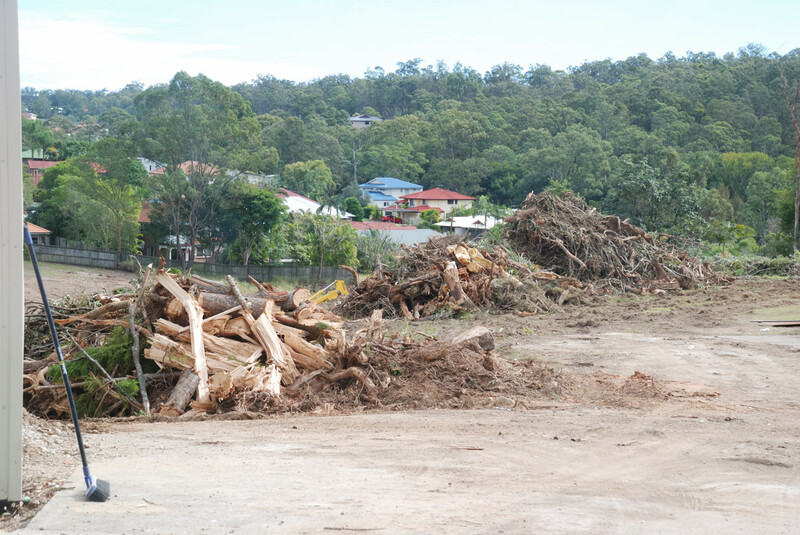 Recycling 100 year old gumtrees into wood-chips! 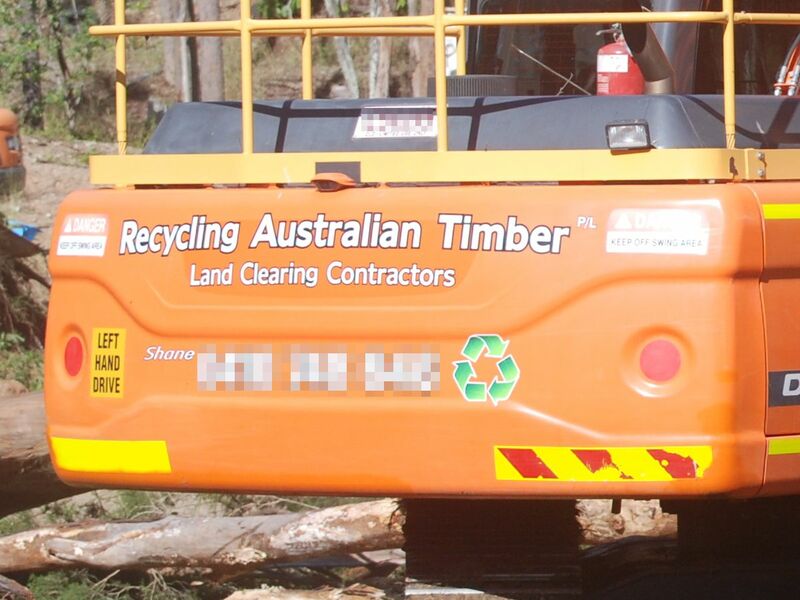 It reads "Recycling Australian Timber" and has a green recycle symbol on it! You be the judge: is this an ultra-cynical example of greenwash, or is someone deliberately taking the piss? Having seen the man who operated the excavator, I am inclined to the latter option. He was not merely some unfortunate worker "just doing his job" who "had to earn a living", but a sneering individual who clearly enjoyed what he was doing. 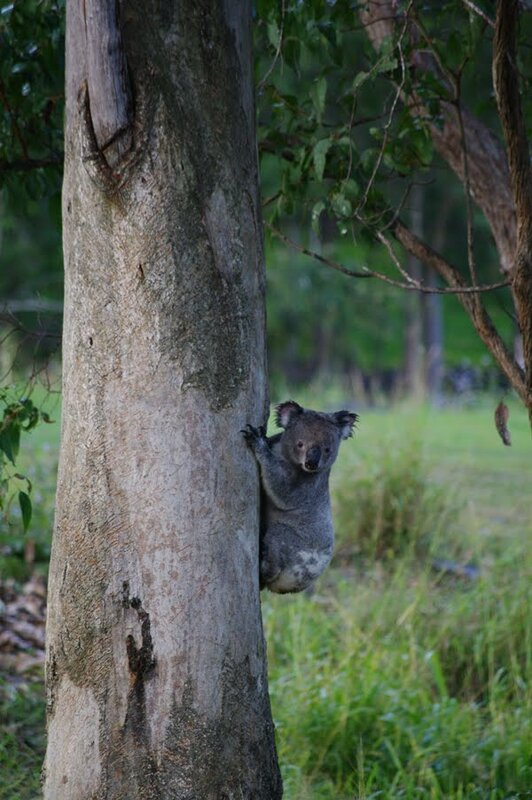 After he had felled the Koala tree (yes, the very same one featured above), he gave me a big smile and a thumbs up. The website advertising the development is another absolutely jaw-dropping example of greenwash. It is probably best that I don't link it here [although I am quite prepared to name names if it comes to it], but let me just say that the first word of the name of the development is "tree", it has an image of a tree in its logo and the main page of the website features an impressive stock image of sunlight streaming through the foliage of a large beech tree. The sad thing is that the developer had already got virtually everything he asked for with this site. He was forced to concede this one small group of trees only through legal action by the residents (the council was content to rubber-stamp pretty much everything). The trees weren't even occupying a space that he was going to build on. The size of the development was approximately 30 times the size of the Possum TV property, and it contained better habitat and more wildlife. It should never have been developed at all. only killed the wildlife, the trees would soon be repopulated by wildlife from elsewhere, but if the trees are replaced by a high-density housing estate (as will happen here) that will never happen. I could write at some length about the behaviour of the local council with regard to this matter, however there are discussions currently ongoing and the possibility of legal action, so it's probably better if I hold my peace - at least for the moment. Let me just say that so far they have been very much part of the problem. This is so distressing & I just can't believe this is aloud. We have Mike Baird in Darling harbour this Friday & Stand Up for Nature will be outside protesting for stronger laws regarding land clearing etc. Ive witnessed on a smaller scale land owners managing their land inappropriately & sadly watched in horror a family of ringtails habitat get slashed with a slashing component fitted to a bobcat, will keep you posted on that one. I have two ringtails living on my property now who fled from their natural habitat & all the horror & have found shelter here... Will email you with more details later on.